Roll up curtains come in many different designs to fit any aesthetic vision! The warm weather is finally here and that means a lot of sunshine is in the forecast! Enjoying the sunlight is great…until the sun is blaring into your home and making it hard for you to sit in your living room comfortably. It may be time to invest in some roll up curtains for your windows to keep some of that excess sun out. Here are four of the many benefits of roll up curtains. 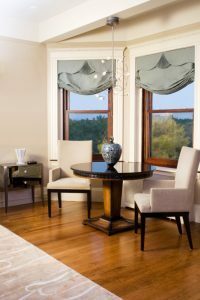 Compared to regular curtains and other window covering options, roll up curtains are very cost-effective. Regular curtains use a lot of fabric, which will cost you more money. Blinds can also be expensive to install, but these curtains are very affordable. This is because they are typically made from a single piece of fabric. Your curtains don’t just have to be for keeping the sun out; They can also add a nice look to your home! These curtains come in so many designs and colors, from a bright solid color, to a floral print. Blinds don’t add much of a decorative element to the home, but with roll up curtains, you are decorating and helping your home! With technology constantly updating, it should come as no surprise that you can get your roll up curtains automated. This is great for someone who has very tall windows or for someone that doesn’t have the ability to reach up that high to roll the curtains up and down. It is also just great for people that don’t feel like getting up to put the shade up! With home automation technology, you can control your curtains with the press of a button. Because roll up curtains come in so many different sizes, they are great for any room in your home. You can switch up the design from room to room to match each specific decoration theme. They are simple enough to use in your bathroom and can be elegant enough to use in the family room. With these curtains, the possibilities are endless! Contact Carroll Awning Today For Your Roll Up Curtains! Ready to get the perfect roll up curtains for your apartment building, business, or home? Carroll Awning Company has the expertise and equipment to make and install the perfect residential or commercial roll up curtains to give your home or business an even cooler exterior. We can design, create, and install roll up curtains, custom canopies, and awnings all year long. For a free estimate and to get started designing your dream awning, give us a call at 1-800-999-5617 or visit us online. To see examples of our work, follow us on Facebook, Twitter,Google+, and LinkedIn.